While farmers may be tired of irrigating right now, I think all who have irrigation are thankful for it in such a dry year. Honestly, thankfully with our irrigation we have some of the best looking crops in the Corn Belt right now. 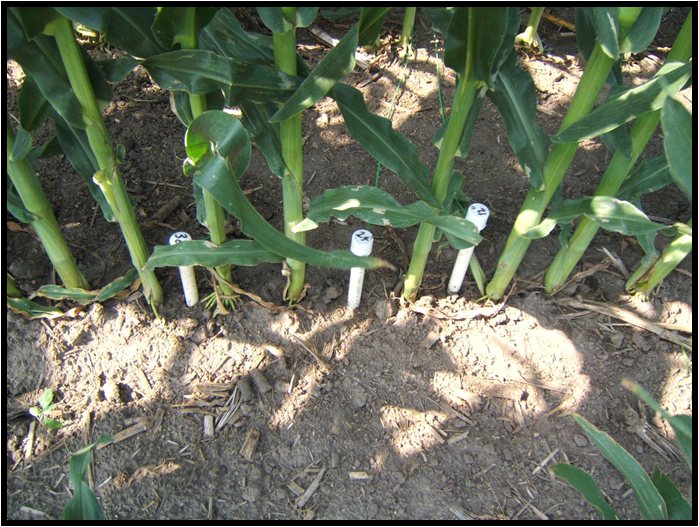 Even so, with corn that hasn’t been replanted nearing dent or stages of starch fill, you may be wondering how to schedule for your last irrigation. For those of you in our Nebraska Ag Water Management Network using watermark sensors, the goal is to use them to determine when the soil profile reaches 60% depletion (for silty-clay soils in our area aim for an average of 160 kpa of all your sensors). You may be thinking, “An average of 90kpa was hard enough!” but as Daryl Andersen from the Little Blue Natural Resources District points out, you’re only taking an additional 0.30 inches out of each foot. So if you’re averaging 90kpa on your three sensors, you have depleted 2.34 inches in the top three feet so you still have 0.96 inches left (see the Soil Moisture Depletion Chart). If you add the fourth foot (using a similar number from the third foot), it would bring the water available to the plant up to 1.28”. At beginning dent corn you need 24 days or 5 inches of water to finish the crop to maturity. If you subtract 1.28 from 5 you will need 3.72” to finish out the crop. Corn at ½ milk line needs 13 days or 2.25” to finish the crop to maturity-so subtracting it from 1.28 would be only 0.97”. Soybeans at the beginning of seed enlargement (R5) need 6.5”. Soybeans in R6 or full seed which needs 3.5 inches yet for maturity. Subtracting off the 1.28” in the four foot profile would lead to 2.22”. The UNL NebGuide Predicting the Last Irrigation of the Season provides good information on how determine your last irrigation in addition to showing charts on how much water the crop still needs at various growth stages. One way to look at this is by the numbers of days left. At 1/4 starch, there are about 19 days before maturity so you can let your sensors average 130kpa on the first week and 150kpa on the next week. If these targets are met during the week, you would put on about 1 inch of water. By going to these numbers, it might give you a higher probability for rain in the next couple of weeks. I’m hoping for many answered prayers that we will see rain in August! Posted on July 30, 2012, in Crop Updates, Drought, Irrigation Scheduling and tagged Agriculture, climate, corn, crop corn, crop water use, Crops, dent corn, equipment, ET gages, Extension, farm, farming, Irrigation, Irrigation Scheduling, natural resources district, nature, Nebraska, Plants, Science, Watermark Sensors. Bookmark the permalink. 2 Comments. Thank you so much, Alice! You are definitely outstanding in your field as well and I truly appreciate you, working with you, and all you do for UNL Extension and our clientele!